Take one obsessive and reclusive young gamer with an aptitude for graphic arts and programming, get him hooked on a specific and unusual game, stop production of said game, and wait for him to take it upon himself to make his own version thereof. It's been tried before, but this time it worked. This is the story. Talon represents the culmination of countless hours of work, spread out across ten years. It is, I admit, the results of my obsessive love for a little game called Descent. Maybe you've heard of it, maybe not. Descent established an esoteric genre called 6DoF, Six Axis, or Vertigo Shooter. It was a groundbreaking game in its day, and one not easily forgotten. There was something very special about Descent. It's difficult to describe, but fans of the game will know what I'm talking about. Some people found it harder than others to adjust to the unrestrained flight mechanics and get to grips with the complex controls, but those who did would never be the same. It was addictive. The freedom of flight, the tension of the hunt, the thrill of the kill. It was like nothing else, and once you were hooked nothing else would do. Not for me, anyway. When the forth sequel was canceled, there was great frustration and disappointment among fans. No one was happy, but eventually most players moved on to other games. I tried, but while many other games were fun, nothing else satisfied the addiction. Perhaps it was withdrawal symptoms impairing my judgment, or more likely just the naivete of youth, but instead of accepting the passing of my beloved game and moving on, I got it into my head that I could make my own. 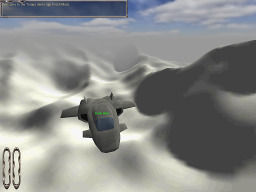 I had build a number of maps for Descent, fancied myself a capable 3D artist, and having written a couple of Tetris clones in TI-Basic and Flash, decided I could put these skills together and build my own 3D FPS-style multiplayer flight combat game. I mean, how hard could it be? Hard, as it turns out. Very, very hard indeed. As in, "kids, don't try this at home" hard. Especially by myself, on a budget of naught. I could have tried to recruit help and find investors, but I didn't know how to do that, and besides, who would take me seriously? Truth is, I was uncomfortable involving others in what I knew was a foolhardy endeavor. Despite how I joke about being over-confident, I was expecting to fail, and I didn't want anyone to see me fail. So I kept it to myself. I'm still not sure whether that was wise or idiotic, but I digress. Fortunately, I was good at building things, and more importantly, I was obsessive. So I found an engine I could work with, a few basic modeling tools, and set to work. Nothing was easy. 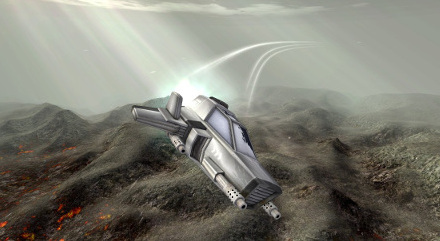 The engine needed work, the physics were dodgy and unreliable, the input was not responsive enough, the graphics looked flat and dated, and the 3D positional audio broke when the camera rolled upside down. The tool chain was incomplete. The only model exporter for the engine's object format that I could use built the model out of triangle strips with a single triangle in each! The result was terrible performance for even simple, low detail models. I had to write my own model converter. The map building tools weren't much better. And so it went on like that. I tackled one problem after another, in between improving my art skills and slowly building up art assets. Progress was slow. Technical obstacles were discouraging, and "life" often got in the way. Years went by, and eventually an entire decade, but the dream of having my own 6DoF game, eventually being able to share it and once again getting my multiplayer "Descent fix" kept me going. Ultimately, persistence paid off! It's been a long road, but what started as a foolhardy "pet project" has become a full and proper game. Talon is nearing completion, and I couldn't be happier! Beta testing has gone well, I have a playable demo out, and we're on track to begin Early Access sales soon. Success! Celebration! Jubilation! Well, almost. The final "push to the finish", as it turns out, is the hardest part of all. Things are set in motion and expectations must be met. Marketing, publishing, and related business issues that I had avoided all these years must now be dealt with. On top of that, I'm not the carefree and responsibility free kid I was when I started, and it remains to be seen how long I can afford to keep doing this. The long, lonely struggle is over, but it's sink-or-swim time for Talon as a product, and me as an independent developer. This story is not quite finished, but we'll have to wait to see how it ends. 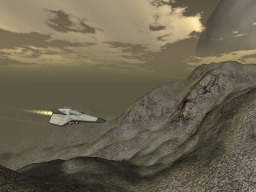 Talon is built on Torque Game Engine version 1.3, with extensive modification. Ship control and flight dynamics code is entirely custom, as is the AI. The network system is one of Torque's strong points. The engine is multiplayer to the core, and provided a solid network framework; although I have made many changes and optimizations to reduce the impact of network latency and improve high-speed, high-precision gameplay in Talon. Torque's rigid-body collision system has always been a weak point of the engine. Fixing that was a critical and significant challenge in developing this game, and I probably spent more time on that than any other single component of the game. Graphically, I did the best I could with what I had, for the most part. Talon looks a lot better than stock TGE graphics, but the underlying render code is almost entirely unchanged. Although I want Talon to look good, my focus has always been on gameplay first. The advantage of this is that Talon can run on a wide variety of systems, and it even performs reasonably well on old systems and on weak computers like netbooks that were never intended to be serious gaming systems. Talon won't become a standard for benchmarking high-end gaming rigs, but even modest gaming systems should enjoy smooth, high framerates.